Click the name of the page. In the editor, click the form module. 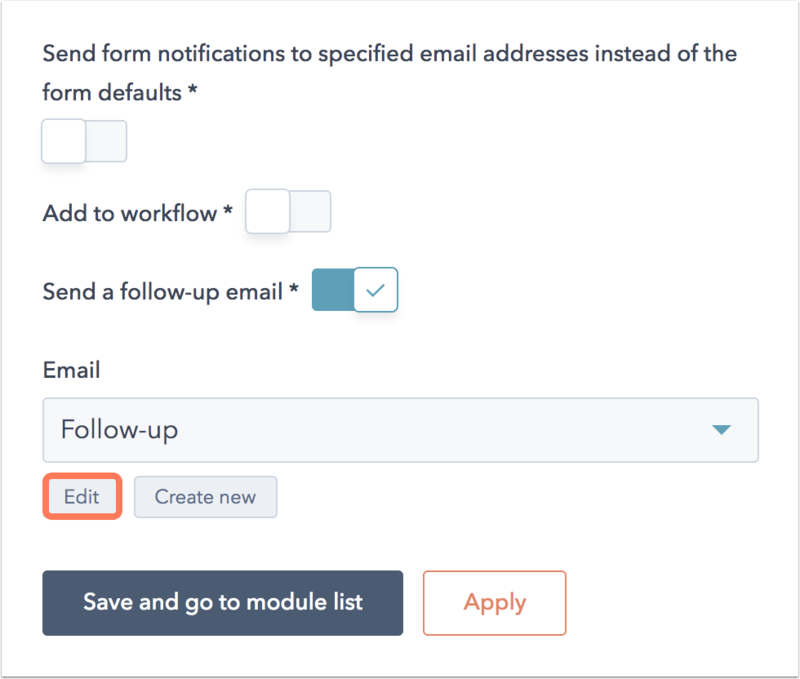 In the left pane, Post submit actions section, select the Send a follow-up email checkbox. 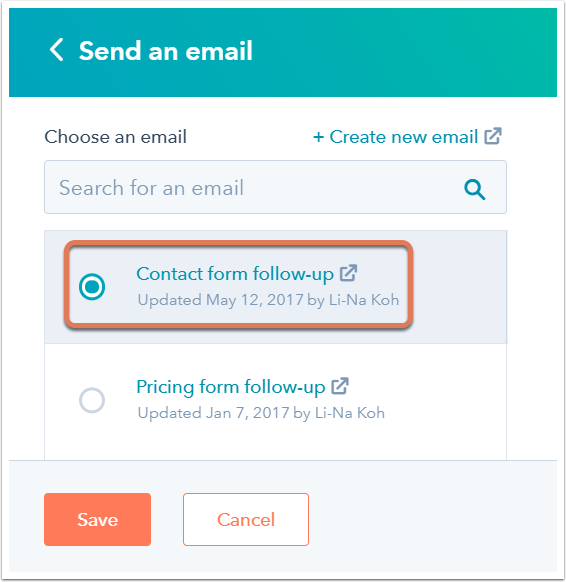 Click Add new to create a new follow-up email. In the dialog box, enter an Email name and click OK. The email editor will open in a new browser window or tab. Edit, customize, and publish your new follow-up email. When you're done, return to your page. Click the Send an email dropdown menu and select your new follow-up email. In the upper right, click Update to take your changes live. Please note: follow-up emails can only be created via the form options on a HubSpot page. Emails created directly from the email dashboard will not appear in the Select an email dropdown menu. Learn how to edit existing simple follow-up emails. Create and publish an automated email to send as an email response to a form submission. In the upper right, click Create workflow. In the left pane, select Contact-based. Select Start from scratch as the workflow type. In the right pane, select Form submission. Click the Contact has filled out form dropdown menu. To send an email response if a contact submits any form, select any form. To send an email response if a contact submits a specific form, select the form. Click the on dropdown menu. To send an email response if a contact submits the form on any page, select any page. To send an email response if a contact submits the form on a specific page, select the page. (Optional) Click Refine by... to select a date range or number of times the form was submitted. Click the plus icon + to add an action. In the right pane, select Send email. In the Choose an email section, select your published automated email. In the upper right, click Review. After reviewing your workflow settings, click Turn on to activate the workflow. 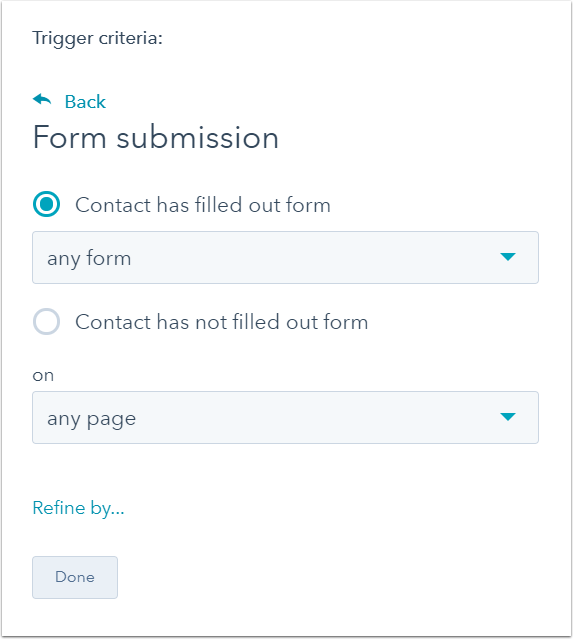 Once the workflow is activated, contacts who submit the selected form will automatically be enrolled in the workflow and sent the automated email response.